When Susan and I ran Miwok last May, my sister, Gretchen, came out to help crew us and watch Susan’s son. At the time Gretchen was about to give up on her own running. After years of running half marathons, she ran her first full the year before. Unfortunately a falling-out with her running partner now made it tough for her to imagine running solo. 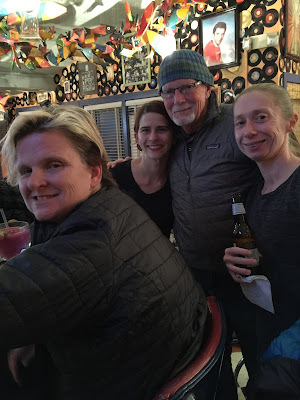 But there was something about the whole Miwok experience that made Gretchen excited about running again, and by the end of the weekend she was on ultrasignup to find a good first 50k, and already had a coach in mind. After several hours of driving and listening to Willie Nelson (mandatory), we finally made it to The Flying L Dude Ranch in Bandera, TX. We booked the bunk house so we had a place large enough for all of us, which included Gretchen’s coach Jennifer Kimble, her boyfriend, and our parents. After we all settled in, we talked to Jennifer and Jorge about Bandera, since they had ran it several times before. Jorge told us it was a pretty hilly and technical course with a lot of loose rocks. Having grown up in Texas, I had no doubt that the trails were going to be a bit different than what we normally run on. But having spent the last 15 years in Oregon, I had my doubts about how hilly the course would feel to Susan and me. I kept my mouth shut and listened to what Jorge had to say about the course and really wondered how the rocky course would affect me by the end. We ended the evening by having a Shiner Bock in the ranch saloon. We chatted with some locals who were very friendly and supportive of the race. 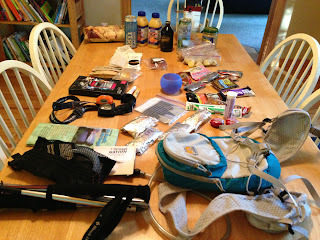 Gretchen was starting to look nervous, so all us seasoned ultra runners gave her last-minute advice and planned out the details on when we were going to wake up and leave. Despite being only 20 minutes from the start, we left the dude ranch an hour and half before the start time. Jennifer warned us that the traffic and parking can be horrible, and the last thing we wanted was for Gretchen to have to run to the start. Luckily traffic wasn’t too bad for us and we got front row parking. Gretchen seemed a lot calmer than she did the night before; she had managed to get a full night’s sleep. I, on the other hand, only managed to get 2-3 hours of sleep. We hung out in the car to stay warm until it was time to head to the starting line. I was curious on how they planned on starting 3 races (25k, 50k 100k) at the same time with ~1500 runners. We found out soon enough as we headed out of the warm car to the not-so-warm start. If I had paid attention to the course maps I would’ve noticed all 3 races started at different places along the route. We got a quick picture of the 3 of us together and wished Gretchen good luck before heading off to the 25k start line. 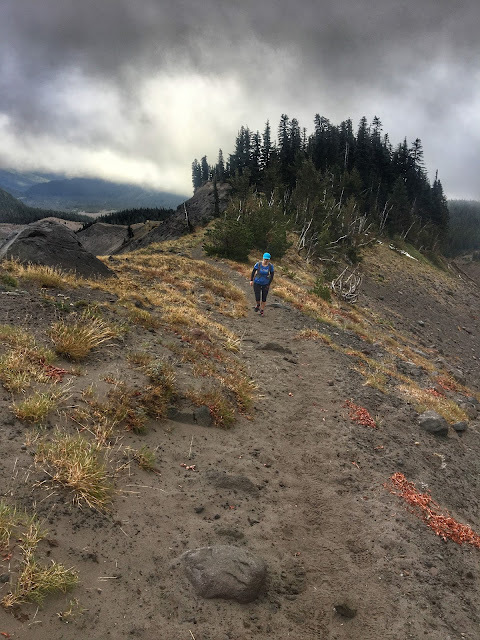 We were disappointed that we didn’t get to run with Gretchen at the start of the race, because we were not sure we would see her again until the end of the race; you couldn’t park at any of the aid stations and cell coverage was spotty at best. The race started and Susan took off. I was tired from not getting much sleep and didn’t seem to have as much energy as she did to break away from the pack. I figured once we started up the first hill I would catch up with her. The first climb was only a couple hundred feet but it felt difficult. The loose rocks were wet and slick from morning dew, the race hadn’t thinned out yet and people were trying pass on either side, including Susan. She finally waited for me at the top and asked if I was ok, since I am normally right behind her. She slowed down a bit, eventually the pack started to thin out, and we began to find our footing on this new terrain. By 8 am the sun was out and I realized I had overdressed. I was no longer making fun of Susan in her running skirt, instead just grateful we were only running the 25k or I would’ve burned up in the afternoon sun. It was definitely the opposite of the January weather we have in Portland. Somewhere between Lucky Peak and Carin’s Climb Susan saw a large cactus and shouted, “Oh my god a CACTUS!” I am sure everyone around us though we were crazy. The rocks were still wet as we made our way up to Carin’s Climb, and since we both had already slipped once, we were careful as we made our way to the top. We were rewarded with an excellent view over the Hill Country State Natural Area. It was strange to have such a vast view without a mountain peeking out over the horizon, but beautiful nonetheless. As we approached the second aid station (the first was only 2 miles in) I was getting excited to eat a snack and talk to aid station volunteers, but I was disappointed to discover it was only 2 guys with a water jug. We thanked them for being out there and headed on. We checked the time and realized the race was going to take us longer that we thought. Our plan was to head back to the dude ranch after we finished, shower and meet up with Dad and Stephanee, but given the time we weren’t sure this was going to be a possibility. Luckily Susan had a little bit of cell coverage, so we tried to call Dad to let him know we weren’t going to make it, and to meet us at the finish line. Unfortunately the cell coverage wasn’t as good as the bars on the phone indicated; after a few failed attempts we continued on. We knew the 25k and the 50k course followed the same route for at least the first 8-9 miles and we were starting to wonder if we were ever going to see Gretchen. Just as soon as we were done talking about Gretchen and crested a hill, we saw her. We started yelling her name and she turned around, surprised to see us. We were so excited to be able to run with her. She was in such good spirits, she told us how well her race was going and about all the people she had met and talked to in the first few miles of her race. We ran with her until the 25k and 50k split off from each other, which seemed to come too soon. We told her to text if she had coverage at aid stations and we would try and meet up with her during the last 25k of her race. We eventually made it to the Cross Roads aid stations, which I was excited to see was a full aid station with all the normal stuff you expect to find at an aid station, plus cheese quesadillas! We chatted with the aid station volunteers for a bit and headed out to finish up the last 5 miles of our race. The last 5 miles were so runnable that they flew by. We reached the Last Chance aid station and were surprised when they told us we only had half a mile left to the finish. We finished in 3:24, which left us enough time to hurry back to the dude ranch, shower and get back to support Gretchen. About the time we met up with Dad and Stephanee we got a text from Gretchen saying that she had a big blister forming and wanted us to meet her at the Chapas aid station (mile 15.5) with her other shoes. 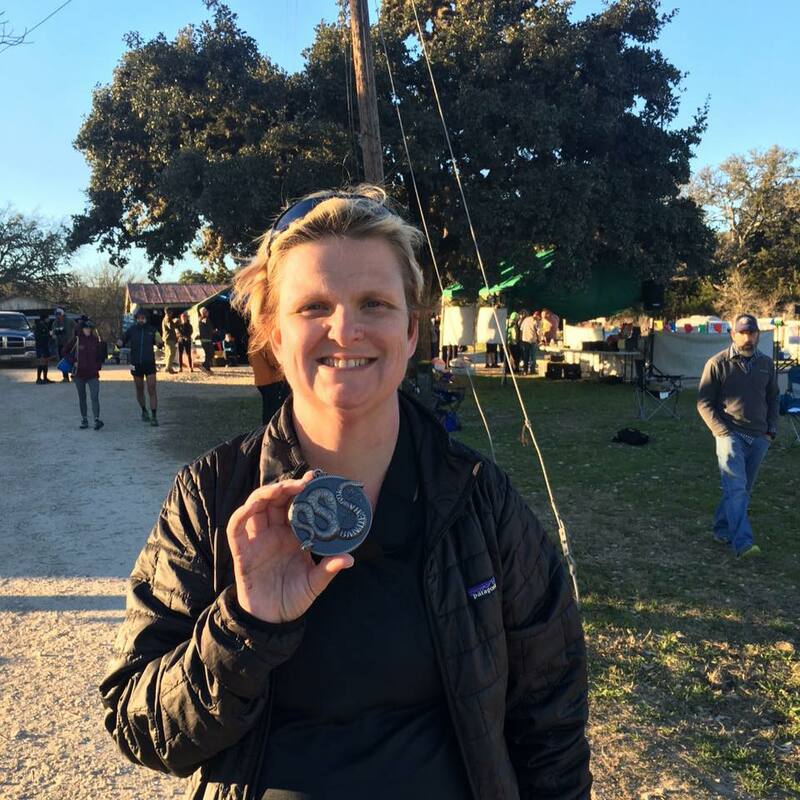 We didn’t have enough time to get to her, but we could meet her at the next aid station, Cross Roads (mile 21.35 and mile 26.31). Since Susan and I had already been to that aid station during the 25k, we knew it was easy to access from the road, but since we weren’t allowed to park there we would have to drop a few people off and come back to pick them up. When arrived at Cross Roads we were surprised to see a lot of people parked in the parking lot at the aid station. It appeared that if you had a parking pass from the ranger station you could park there, so Dad and I headed off to get parking passes for both of the cars. Well apparently this really wasn’t the case, as we were informed by a very nice but frustrated volunteer. She did, however, tell us if our runner was coming in soon we could wait but would need to move the car right after. Feeling relieved, we waited for Gretchen. Susan and I decided that if Gretchen wanted us to run with her, that one of us with go with her for the next 5 miles and since she would be back to the same aid station the next person would run with her to the finish. Not long after we arrived, Gretchen came running in. We started cheering and rattling our cowbells, she looked a little tired but as happy as she did when we ran with her in the morning. We grabbed a chair for her, and Susan took charge of helping her change shoes while the rest of us helped get her food, coke, and fill up her water bottles. After she ate, Gretchen and I headed out. Gretchen didn’t need me to run with her; she was doing amazingly well, but it is always nice to have someone to run with and talk to. I kept her entertained with stories from our 25k. I followed her lead, walking the uphills and running the flats. 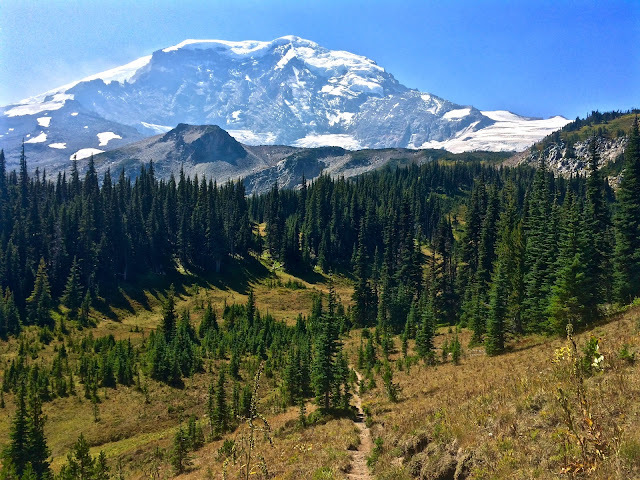 As we neared the aid station I could tell the day was starting to catch up to her, so I encouraged her to run in. As we did, we heard the cowbells and cheers, and my dad came running up to tell us we were ahead of (his) schedule (editor’s note: he was calculating the splits and pace times the whole time we were waiting!). 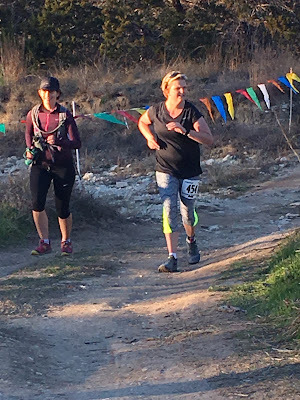 After Gretchen had a few bites at the aid station, she and Susan were off to tackle the last 5 miles of the 50k. Dad, Stephanee and I walked back to the start, grabbed a hot chocolate and cheered on runners as they crossed the finish line. Gretchen heading towards the finish line. As it got closer to when my Dad thought Gretchen should be finishing, he was constantly checking his watch and saying, “she should be here by now”. It was cute to see him worrying, but Stephanee and I reassured him Gretchen was fine and probably just taking her time because the last miles of your first 50k are incredibly hard. 9 hours and 30 minutes after Gretchen started, she crossed the finish line with the same smile she started with. I was so proud of her-- we were all so proud of her! It was awesome to be there to see her cross the finish line, but even better to be able to help crew her and be there for moral support. 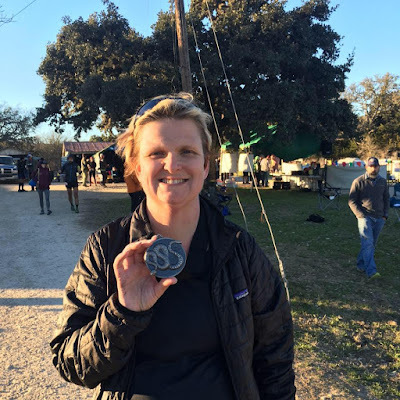 I can’t end this blog post without saying what an amazing race Tejas Trails puts on. Thanks, y’all.